There were several days while we were in Hong Kong that there weren't any Jackie events planned.  On one of those days, we took a trip to Hollywood Road. There are many, many antique shops on Hollywood Road. The first shop we walked into was very fancy. There were three floors in the shop. As we walked from floor to floor looking at things, one of the employees followed us, I suppose to make sure someone was there in case we had any questions. Most of the items for sale were very expensive. I wish we had taken some pictures in that shop. There were plates and furniture and many things that were hundreds of years old. I really, really wanted a gorgeous plate with a dragon on it. It was expensive, though, and I was worried about getting it home safely. Kath, being an artist, was interested in the paintings and prints. They were all lovely. Nic looked for swords and Stephanie looked for Buddhas. Not being a real collector, Mark looked at everything. It was neat to look at all the things in the shop, but I was afraid I was going to break something. We all made sure we walked slowly and carefully. After looking at all three levels of antiques, we thanked the people in the store and went back out onto the sidewalk to continue our search for treasure. The next shop we visited was the exact opposite of the first. It was very, very tiny. I think we would have walked right by it except Kath spotted some masks on a stand sitting out on the sidewalk in front of the store. As she looked through them, a smiling gentleman, who I think was the owner of the shop, came out and said he had more masks inside. He led us into what reminded me of my walk-in closet at home. It's the kind of closet where you have a row of clothes on each side and a path down the middle. On each side of the shop there was shelf after shelf of goodies. We stood side by side in front of a glass counter where a woman was standing who I think may have been the man's daughter. If someone wanted to look at something on the other side of the store, another one of us almost had to stand out on the sidewalk so they could pass by. But we didn't mind at all. There were so many fantastic things to look at! 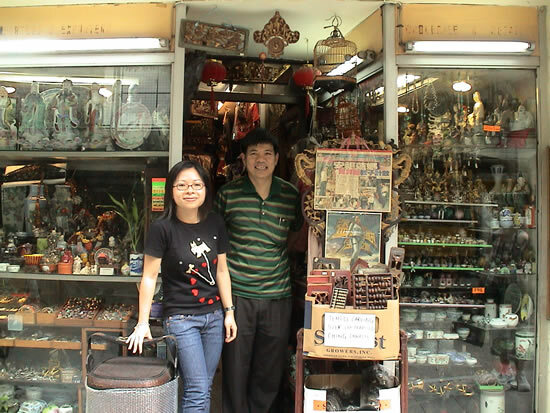 The Hollywood Road antique shop owners in front of their store.